A December stroll through town. | Come Here To Me! « The Misneach hunger strike, 1966. A December stroll through town. For a few weeks now I’ve been living in Dublin 7, about a ten minute stroll from the centre of town. I’ve made the most of it, and try to carry a camera. 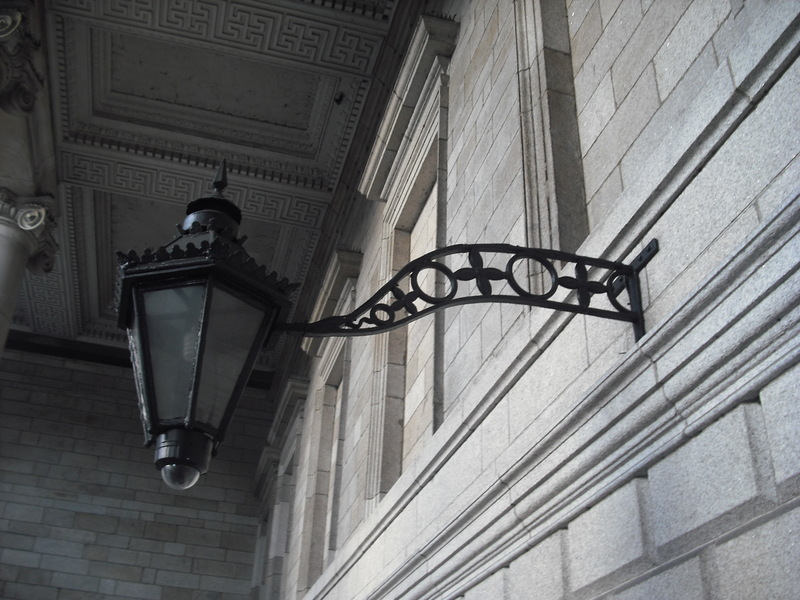 I’m by no means a photographer, far from it, but I enjoy taking the occasional photo in Dublin. Last Monday, with crazy season well under way and people shopping until they drop, we went for a wander around town. We planned to have lunch in the Paris Bakery on Moore Street. 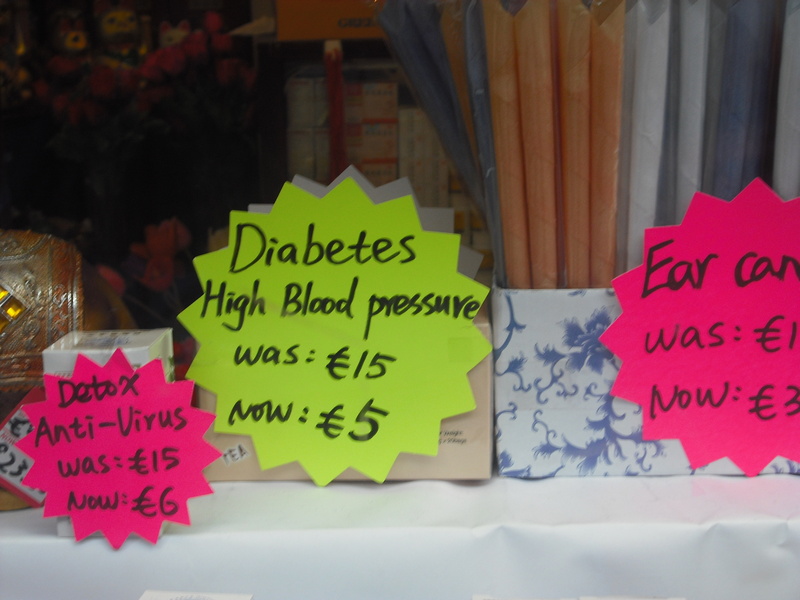 On the way, we passed this gem in the window of a shop on the corner of Moore Street and Henry Street. I think I’ll pass on it. A bargain. On the corner of Moore Street and Henry Street. The Paris Bakery continues to grow, and brings a real bit of life to Moore Street. It’s never empty, and the food is highly spoken of by most Dubs. Walking in the door, you can’t help but notice this bit of Moore Street history. 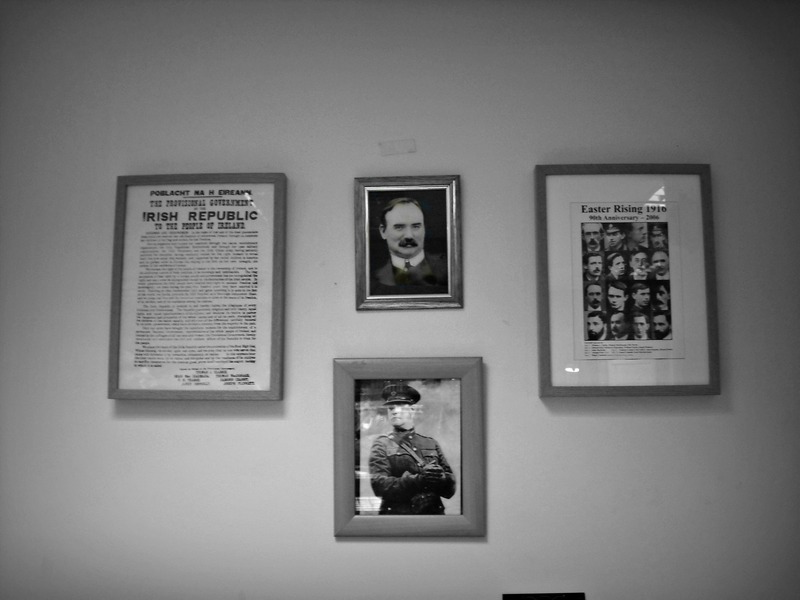 On the menu, you can try the ‘James Connolly’. Unlike today’s Labour movement, there’s no smoked salmon involved. The reds and the greens. We went up to the old Irish House of Lords on College Green for a look inside, and there’ll be more on that in time on the site. Outside, I noticed something I’d not seen before. I stop and talk inside and outside this building weekly with my dayjob as a tour guide of Dublin, but the camera in the lights has always escaped me. Big Brother indeed. 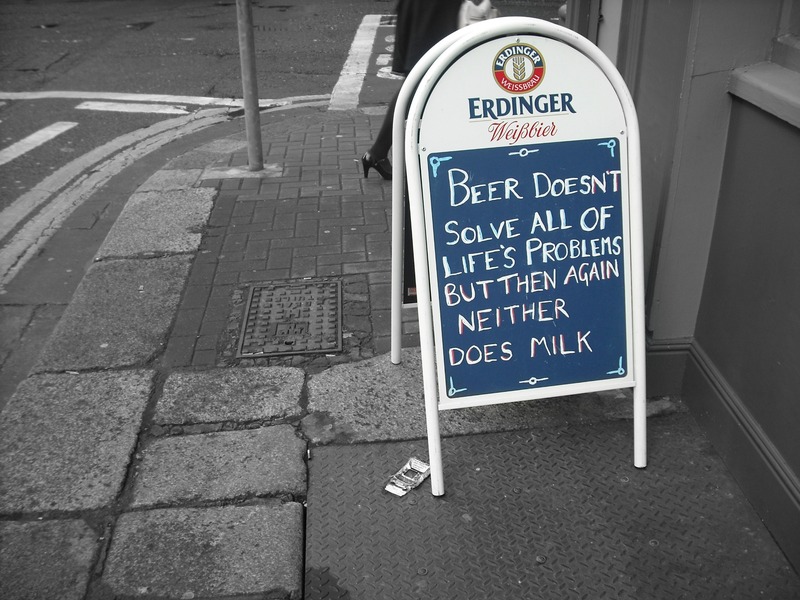 The lads in The Black Sheep continue to make the most of their blackboard. The beauty of living in D7 is being halfway between this place and L.Mulligan’s. No more pints of slop. It took me a minute to figure this one out, it’s not the oardaí but the gardaí it’s aimed at. Chalk doesn’t tend to last long. A future street artist maybe. 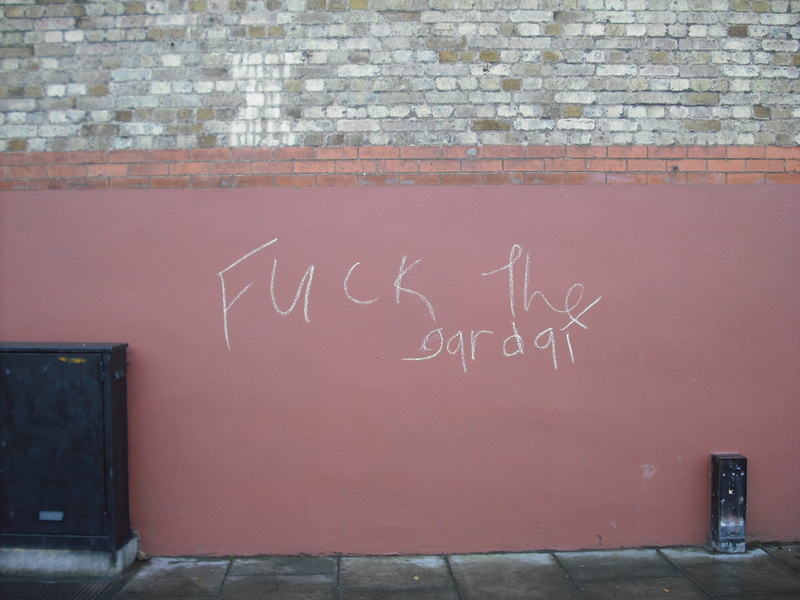 Dublin’s youngest vandal? Chalk in D7. 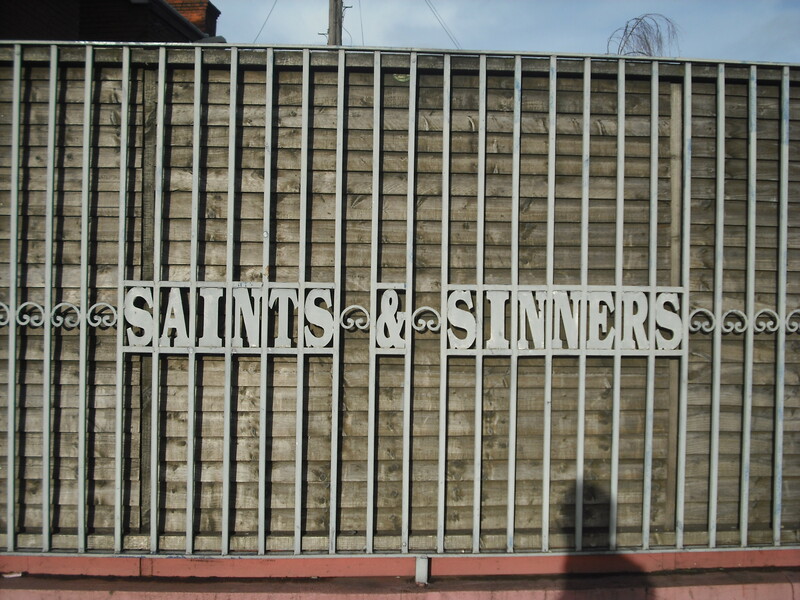 Saints and Sinners on North King Street may be no more, but this nice little detail remains. As a St.Pat’s man, I’m both. There’s always someone looking at ye! According to Mr. Geldof. Before they built that Saints & Sinners monstrosity http://dublincitypubliclibraries.com/content/091-beltons I think there used to me another pub next door, cant remember the name off hand. Which St Pat’s? Juvey? What for? Does it? Can’t say I’ve seen one? I agree with you on the street being far from threatening. Have ate there I think 4 times over the last year or two and never once seen a security guard/bouncer.